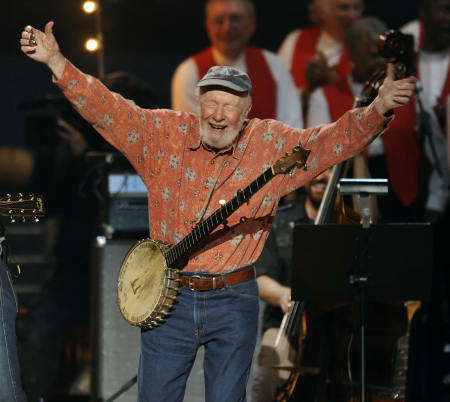 We just finished playing Pete Seeger’s 90th birthday party at Madison Square Garden, alongside Bruce Springsteen, John “don’t call me cougar” Mellencamp, Emmylou Harris, Dave Matthews, and what are frankly too many more for us to list. Thankfully, someone else did list them all. Well we’re just glad everyone got back safe and sound checked. I don’t want to be a dink but even tho’ the clear water is wide ol’ 87 is long, even in a musical Enclave. Michael can row all he wants, but we like it when he drives. All we’ve seen of this is 10 secs of k and chaim’s trousers on you tube. Now I want everyone to buy lotsa Tix for the Royal Albetta Haul show. what is link for dink? No dink link found yet. This land has K&M in last part.